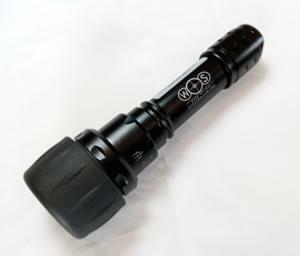 Our BSDE Black Sun Dark Engine IR illuminator is our latest evolution of the Black Sun system. By combining our knowledge of LED systems with the latest laser diode technology we have produced the smallest and lightest illuminator possible, but with extreme performance and usability. Due to careful design, the Black Sun Dark Engine does not fall under laser safety classifications and can be used just as safely as any other LED based IR illuminator. The beam is focussed via a precision multi lens system, providing exceptional beam quality and is easily and smoothly adjusted from flood to spot in under half a turn or the rubberised head. Very good , well worth the money. Perfectly made and has transformed my set up at a bargain price thanks. This unit is a must have if using atn xsite, if your suffering with pixilation in night mode then you need one of these.make sure to centre lamp to scope, and get focus right and you will get an excellent picture even when videoing. Nice compact piece of equipment that does what it says on the label. Very pleased,I didn't need the extra power but it is much more covert than the led illuminators I have.Shot a 100yd fox in first 10 minutes.